From lips sewn shut to lonely roads, the imagery in the exhibition “A Place Called Home” is stark. Busan artists group Exotic Beasts will be holding the exhibition, themed on “home,” to highlight refugee issues and raise money for a local support center. The idea behind the exhibition started with the refugee crisis in Europe, which Ruddy saw firsthand when he returned to Ireland around the time that 3-year-old Alan Kurdi drowned crossing from Turkey to Greece. Returning to Korea in September, Ruddy still wanted to do something to help the situation, and teamed up with Exotic Beasts founder Jeongmin Lee for the exhibition. They later decided to broaden the focus to a less European-centered view of refugees and help a local charity that assists North Korean refugees. “People who are American or not European may have their own ideas about what the word refugee means to them, and a lot of people here have a connection to that (local center),” explained Ruddy. Most of the artwork deals with the theme in more general terms. 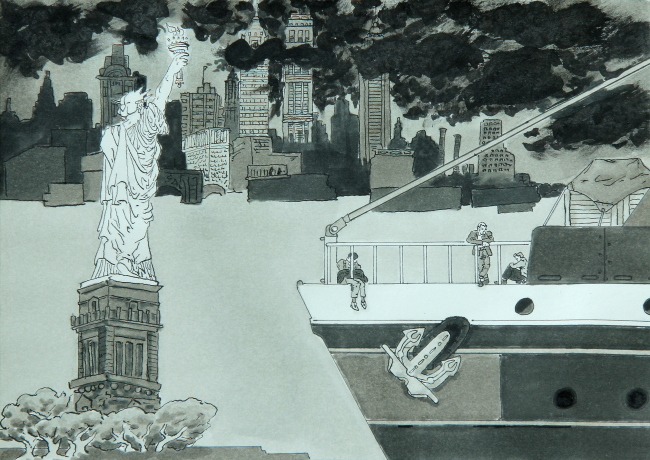 For example, drawings by Michael Melson show different aspects of American migration -- dust bowl-affected farmers, escaping slaves, persecuted Native Americans and refugees arriving in New York. “The final image of the immigrants arriving in America to take flight from war is intended to be cold. Often arrival isn’t the end to a refugee’s hardships. In each successive picture the figures become smaller and more obscured to show their decline and detachment,” said Melson. Posters and postcards will be available for purchase and there will be a silent auction of 12 selected works of art to raise money at the show. Proceeds from the show will go to Busan Hana Center, a government-supported facility that assists North Korean refugees with housing, educational services and their needs while transitioning to life in South Korea. The show will run at Roof Bar in Namcheon-dong, Busan from 2-7 p.m. on May 28. Following the show will be Momgajim 3, a quarterly performance series bringing together physical performers from across Korea to collaborate on new work. For more information on Exotic Beasts, visit www.theexoticbeasts.com.